Do you suffer from Tinnitus, ringing in the ear? Reconnect™ is a combination of 100% natural supplements and herbs that support your hearing at the cellular level. Focusing on replenishing any nutrient deficiencies to offset the loss of cells associated with aging. 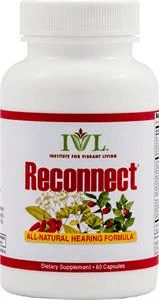 Reconnect™ is a natural amino acid supplement designed with the highest quality of ingredients. Other ingredients: Gelatin, silicon dioxide, rice flour, magnesium stearate.